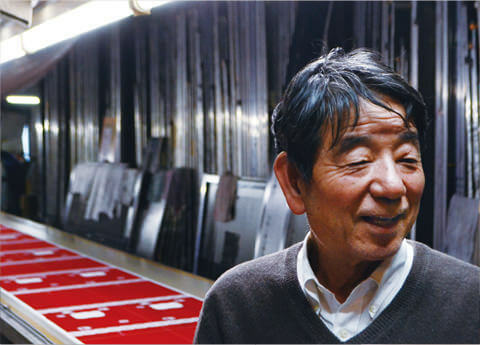 Ashikaga has been supporting Japan’s textile industry for a long, long time. In this time, it has accumulated a wealth of technology and knowledge relating to dyeing processes. 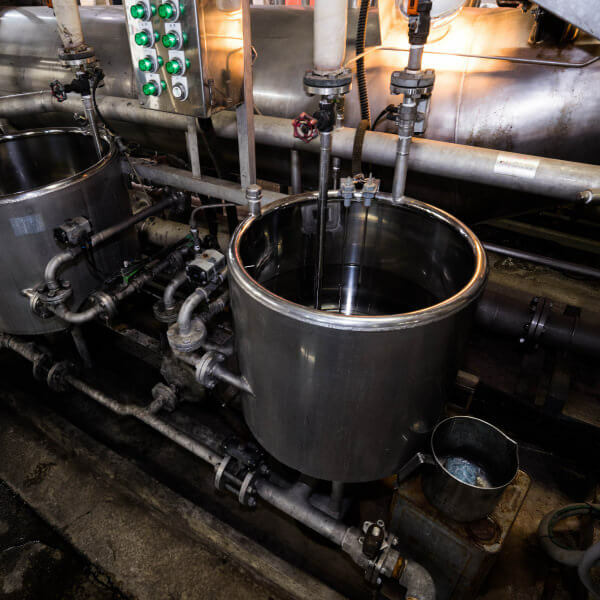 Ashikaga Samurai Fiber conducts research and development on new technologies, focused on traditional and natural Japanese dyeing methods, which are being appreciated anew in the light of today’s environmental problems. 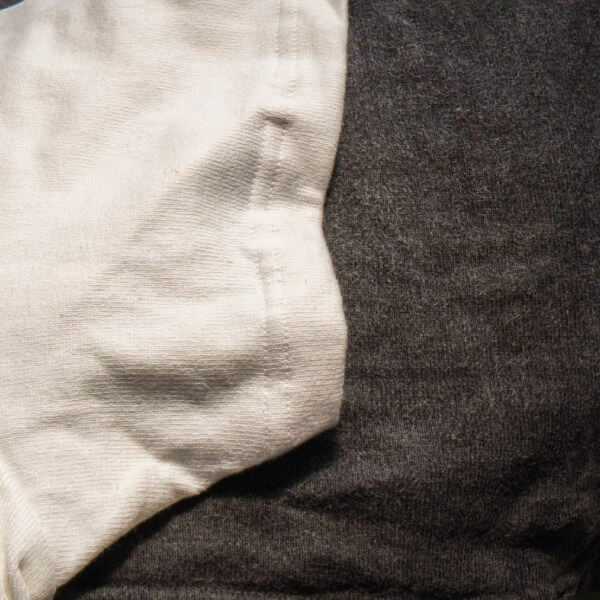 By applying modern chemistry to long-established, natural dyeing techniques, we are reconstructing these methods as contemporary living technologies. This, in essence, is the WA·ZO·ME (“Japanese dyeing”) concept proposed by Ashikaga Samurai Fiber. 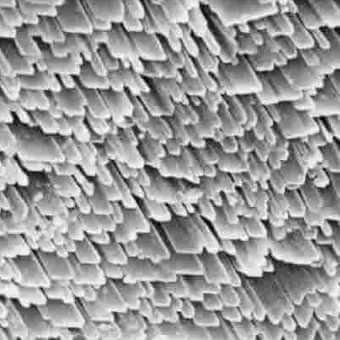 The surface of charcoal, a material produced by burning wood at high temperature, contains countless, tiny, micron-scale perforations. 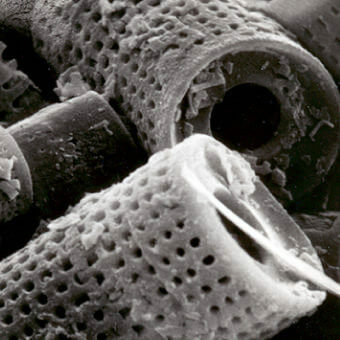 Thanks to their adsorptive properties, these holes generate a deodorizing effect by trapping odor-causing substances. Charcoal also possesses mild antibacterial properties, due to components such as carboxylic acids, phenols, zinc, and nitrogen. As a dye, charcoal is a highly eco-friendly material. 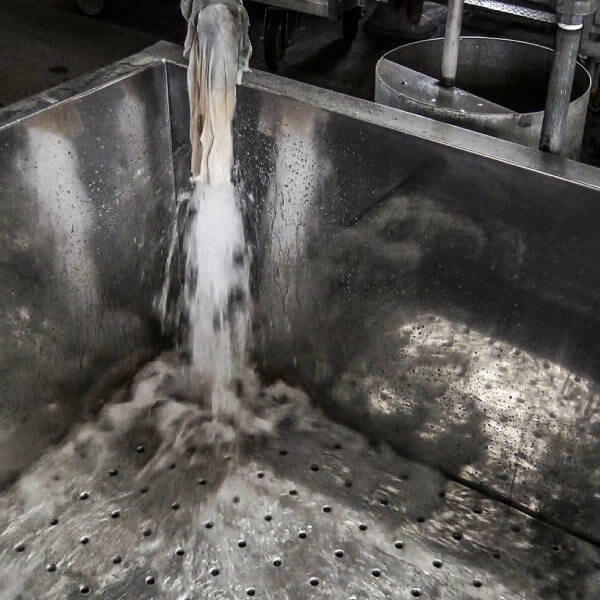 For one thing, its main constituents are originally from nature and can easily return to it, but since charcoal also contains manganese, magnesium, and other minerals, the waste fluid left over from dyeing helps to purify river water. SUMI ZOME is a technology that takes advantage of charcoal’s properties to create better fibers. To create new products using SUMI ZOME technology, Ashikaga Samurai Fiber has worked on charcoal dyeing of synthetic fibers. SUMI ZOME dyeing of synthetic fibers, especially polyesters, which have a dense molecular structure, has always been considered difficult, because dye molecules do not penetrate easily into the fibers. To solve this problem, we took a scientific approach, engaging in repeated trial and error. 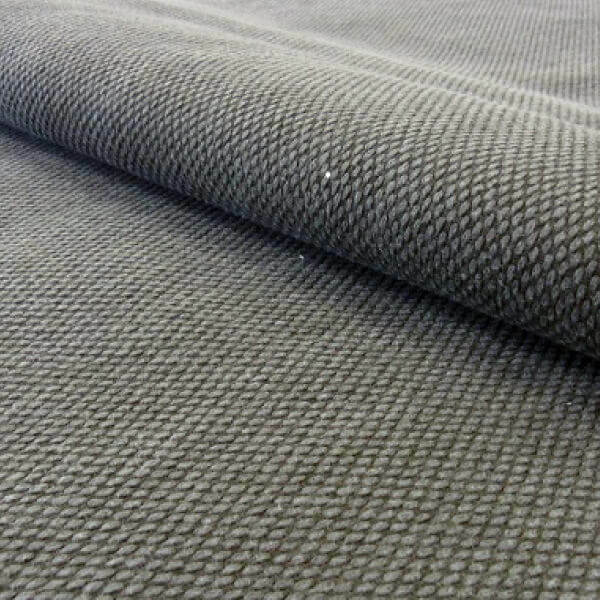 Finally, we succeeded in developing a modern version of SUMI ZOME that is even effective with polyester fibers. Synthetic fibers and SUMI ZOME. This new fusion will greatly expand the possibilities of fibers. Chemical fibers can be dyed by adjusting pressure. 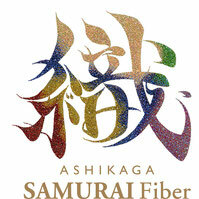 Another field of Ashikaga Samurai Fiber’s research is the development of new dyes. One project aims at developing dyeing techniques that utilize materials with particles that are even finer than those of charcoal. 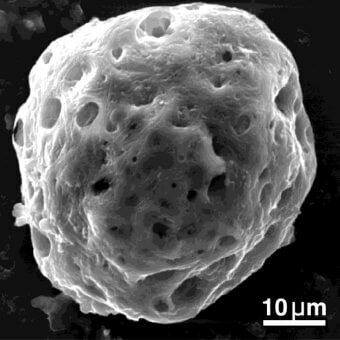 Such materials include KAI BAI (a porous material made by firing seashells), diatomaceous earth, and coral fossils. Long used in plasters for walls, these materials are not only fireproof, but they also possess antibacterial, deodorant, and light-shielding properties. Furthermore, since they produce a finish of white or ivory color, these natural dyes are expected to have a wide range of potential applications. 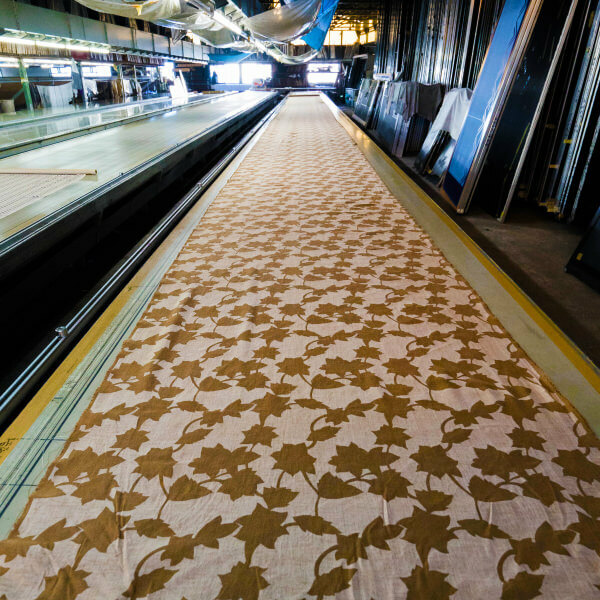 Our unique technology allows KAKI SHIBU to be used for printing patterns and dyeing 25 m lengths of cloth. KAKI SHIBU is juice produced by squeezing astringent persimmons (shibugaki) with a press and leaving the extract to ferment naturally. It contains an ingredient called persimmon tannin, which hardens on contact with air to form a water- and moisture-proof film. KAKI SHIBU dyeing, which utilizes astringent persimmon juice for its resistance to corrosion, water, and mold, and for its antibacterial properties, is a long-established technique employed for dyeing a wide variety of materials. At Ashikaga Samurai Fiber, we investigated this persimmon juice and established a new way of using it to print patterns. 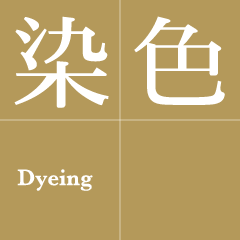 (Previously, KAKI SHIBU dyeing was only used for simple dyeing or brush painting.) In other words, we have improved on KAKI SHIBU dyeing so that it can now be employed for industrial products as well as handicrafts. With technology we developed ourselves, we managed to weaken the tendency of astringent persimmon juice to cause hardening with repeated dyeing. This has made it possible to achieve a finish soft enough for cloth that touches skin directly. We dramatically shortened the [dyeing] → [drying] process. Previously, the process had to be repeated dozens of times to build up the color intensity; now several times is enough. This innovation enables a reliable supply of textile, both in terms of quality and delivery time. 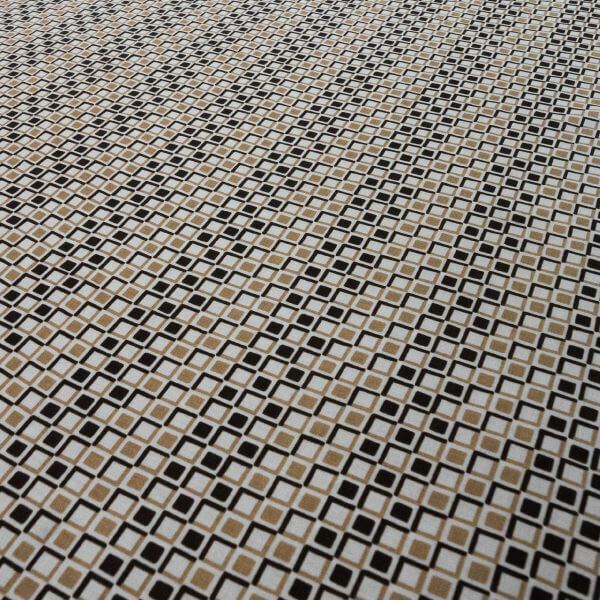 Patterns can be printed freely using two or three KAKI SHIBU colors. 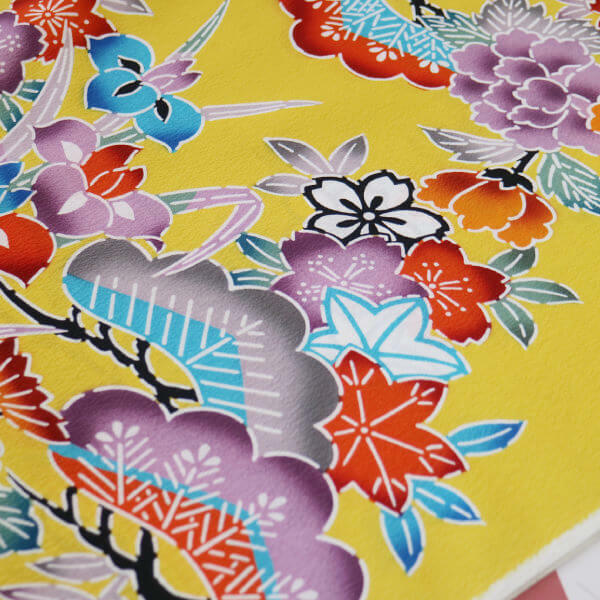 So it is now possible to produce long lengths or patterned pieces of textile for use as kimono fabrics. YU ZEN dyeing enables delicate and vividly expressive designs on everything from the kimonos of elegantly dancing maiko and geiko to the original, glittering costumes of stage actors. YU ZEN is said to have originated in the Genroku era (1688–1704) of the Edo period. The YU ZEN of Ashikaga Samurai Fiber is advanced by combining state-of-the-art technology with traditional techniques handed down from generation to generation for over 300 years. In addition to kimonos, this method is applied to matsuri hanten (festival coats), a garment that instantly conveys iki (stylishness). Although we preserve the traditional style, we cater to a wide-ranging demand in terms of design, color, and even finish detail. Recently, we have worked on bingata costumes of Okinawa, characterized by vivid primary colors, as well as costumes for the traditional awa odori dance, in which each group has its own distinctive look, and costumes for yosakoi, a style of dance performed all over the country. Quite literally, our YU ZEN is coloring the festivals of Japan. Developing new applications through functional dyeing. "Dyeing is a science" claims the company president passionately, stylishly attired in a samue (Zen work clothes) and geta (traditional Japanese clogs). 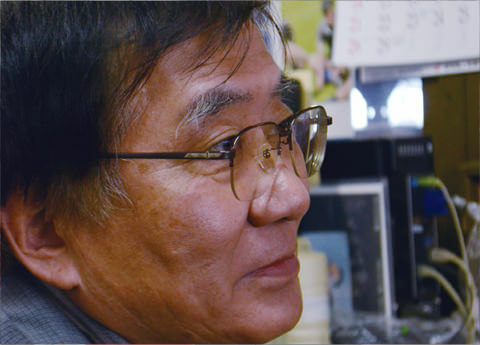 Mr. Hatsuyama, a popular member of the Samurai Fiber community, applies science to the world of functional dyeing. Using innovative dyeing technology, the company has developed new applications centered on functions such as water resistance, insect resistance, and water repellence. Right now, efforts are focused on flame retardation. 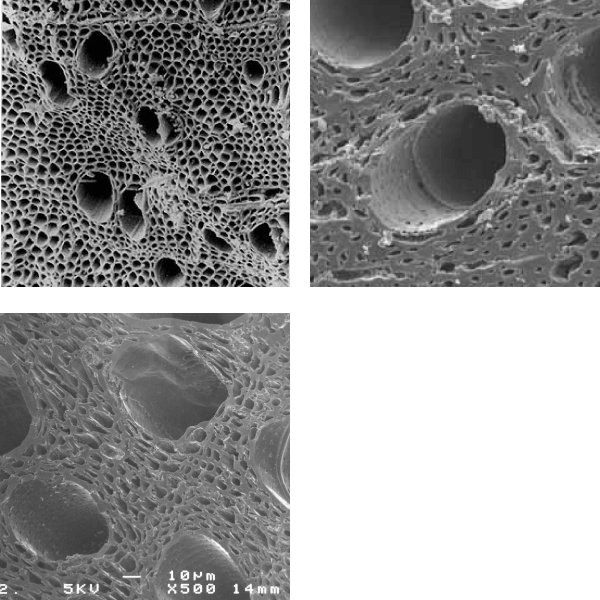 This is the development of functional fabrics dyed with a flame retarding agent that self-extinguishes in the event of a fire to prevent the spread of flames. As Mr. Hatsuyama points out, however, even with sophisticated dyeing techniques, developing materials with the functionality to match requirements involves many different research challenges. This work is very laborious because factors such as pretreatment, temperature, time, and the removal of surplus material are different for each kind of fabric. And if this work is not done thoroughly, the product after pretreatment is likely to bleed, discolor, be unevenly dyed, or smelly. This work is so tough that a normal dyeing house would not even attempt it. In light of this, the company had to leverage all its accumulated expertise and run repeated experiments, but finally it managed to create a new technology for treating printed fabrics to render them fire-retardant. This new world-leading technology will undoubtedly open up large markets as it meets new emerging needs. Understanding printing, exploring materials, and investigating processes. The ability to freely control the printing and coloring of fabrics is a vital technology for truly excellent results. CEO Mr. Tsurugai explains that color serves a number of interrelated functions—e.g., attracting, soothing, and emphasizing—and that to control the delicate process of mixing colors and prepare the dyes to achieve the desired effects for each of these functions, it is vital to have an experienced technical expert with enough understanding of these color functions to predict the finished result. At the same time, color data management is also very important, because data on past color mixing makes it possible to quickly approximate a desired color from a palette of tens of thousands. Recently, the company has also been working on a printing process for garment dyeing that uses natural dyes such as kakishibu (persimmon tannin) and charcoal, which are environment-friendly and non-toxic. It is now marketing kakishibu dyes, which offer excellent decay resistance, insect resistance, and water resistance, and charcoal and liquid charcoal dyes, which function as deodorants. 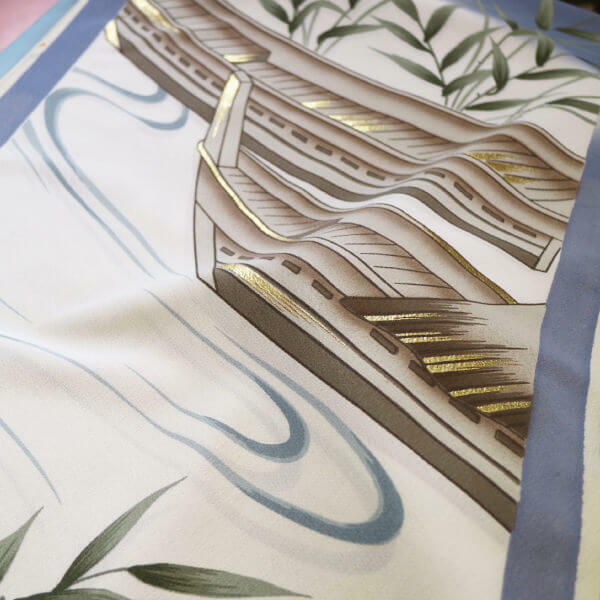 Another recent initiative, focused on the recent revival of interest in Ashikaga meisen (common silk fabrics) of double width (100 to 120 cm), aims at addressing demand for use in clothing. In addition to its printing work, the company will be developing special processing techniques in the years ahead, so we can expect to see it deliver more interesting offerings. Stimulating developing through regional networks. 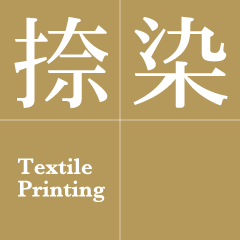 Ashikaga is home to numerous textile-related businesses that between them possess a wide range of specialized technologies. Company president Mr. Tano is involved in the whole chain of local production, from product conception, design, and trial manufacture, to mass production management and delivery of finished products. 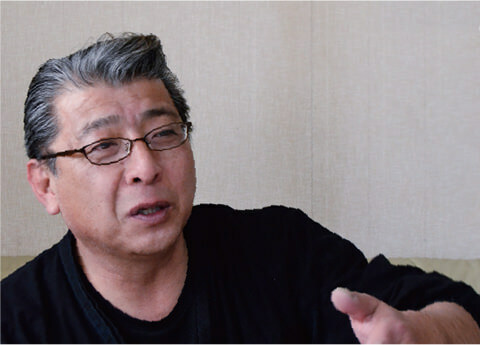 At the same time, he serves as a representative of the Ashikaga Fiber Technology Project. With extensive know-how and experience in manufacturing, and an intimate knowledge of local companies, he works essentially as a product producer, utilizing a network of manufacturers. Mr. Tano is seen as a pillar within the network, because of his ability to respond politely to even the most difficult requests, and also for his personality and great vitality. His forte is the development of special, unique garments such as yosakoi dance costumes, for traditional Japanese festivals and other events—something that requires much energy. 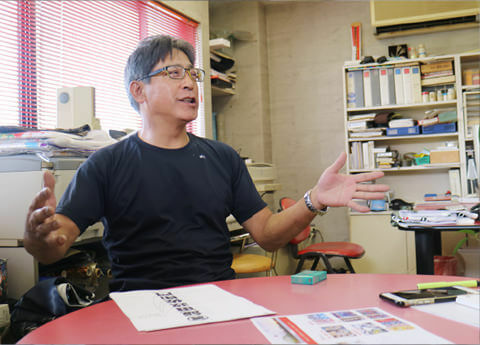 Recently, he has even started fulfilling orders from overseas, fueled by growing demand for “cool Japan” goods. 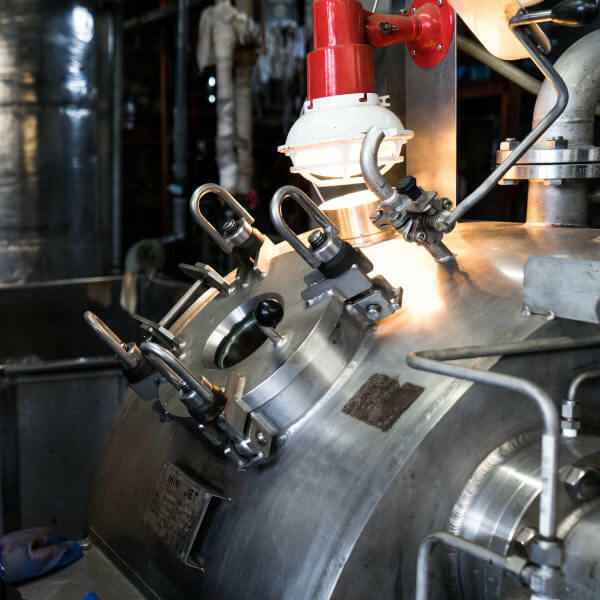 In all this, the ability to sense the needs of the client and the ability to determine the right manufacturing process, taking into account delivery time and budget, are both important. As well as being the commander-in-chief of the Samurai Fiber initiative, Mr. Tano is a world-class salesman with a good eye for international market opportunities. Irodori Co., Ltd. is an enterprise founded in 1895. For over a century, this long-established store at the foot of Watarase has been engaged in YU ZEN dyeing . In our quest to acquaint ourselves with the traditional costumes of Japan, we have explored their delicate visual expression. We have worked diligently on the YU ZEN dyeing of many different patterns—from kimonos for elegantly dancing maiko and geiko to the original glittering costumes of stage actors. 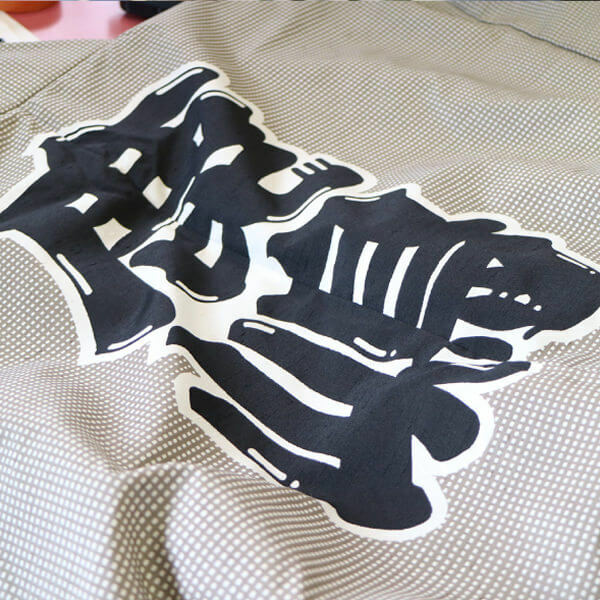 At the same time, without sacrificing traditional style, we cater to a wide-ranging demand in terms of design, color, and even finish detail, for matsuri hanten (festival coat), a garment worn by men that instantly conveys iki (stylishness). In addition, we work on designs for festival costumes from all over Japan, including Okinawan bingata costumes, characterized by vivid primary colors, as well as costumes for the traditional awa odori dance, in which each group has its own distinctive look, and costumes for yosakoi, a style of dance performed all over the country. Quite literally, we are coloring the festivals of Japan. Looking ahead, our vision is to preserve and hand down Japanese tradition for the future, by integrating leading-edge technology into our technological heritage.